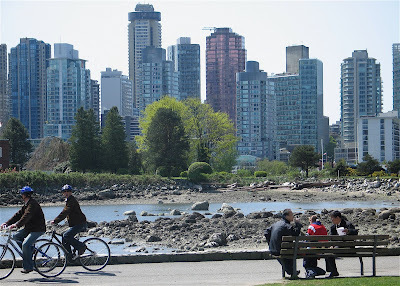 Bicycling in Vancouver's Stanley Park with a view across Coal Harbour. Sue Frause photo. Hilton on Sunday, Jan. 13 at 9 PM PST on NBC. The usual telecast and booze infused dinner from the hotel's International Ballroom has been cancelled. But the writers' strike is affecting more than my TV viewing. Vancouver has felt the impact, as reflects this story in The Globe and Mail: Quiet on the set. Let's hope things get ironed out before the Academy Awards on Feb. 24, 2008.